Things may come and go here, like a messy desk where I put things I’m not sure what to do with yet, or that I just need temporarily. 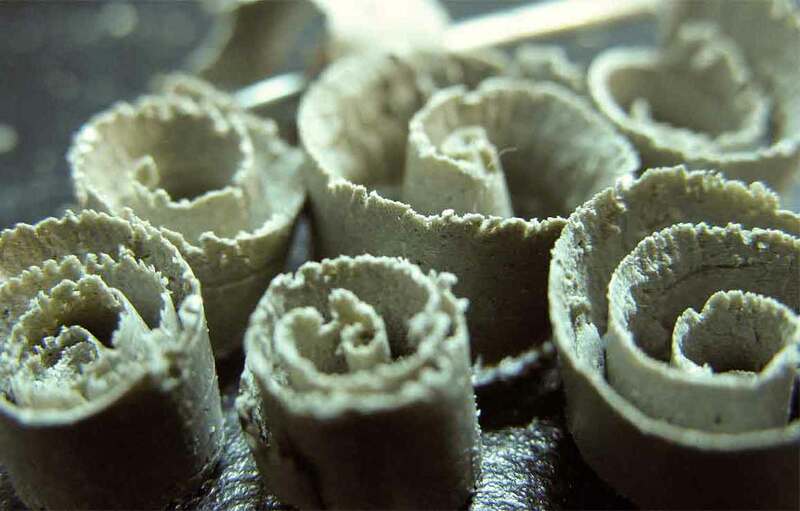 It's great to see a piece finished, but there are intimate little enjoyments along the way too, such as these fine tiny spirals of leather hard clay (from shaping Reprieve's ears). They're about 1/8" to 1/4" across. — Think more in terms of planes. Don’t “round” everything. — If my work looks “stubby” or awkward, keep working with it until it doesn’t. Start all over again from maquettes if necessary, until flow and balance are achieved. Work for a good profile line to start with, refine from there. — Continue to develop focus, determination, resolve, workmanlike habits, positive attitude…challenge myself, believe in myself. Get invested in each piece. Commit. — Strive to develop something unique; something I can put my “signature” on. — Develop finishing strokes that look confident and fluid. 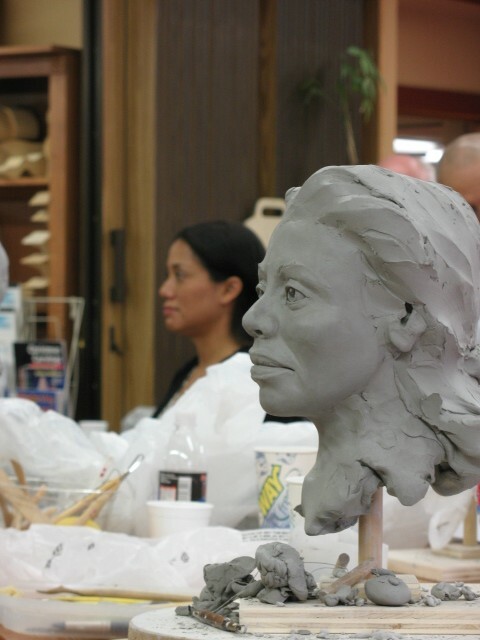 Resist the urge to smooth everything, resist going back and refining too much of the piece–leave it fresh. — Never give up. Don’t give in to discouragement; instead, consciously convert any negative energy into positive energy, and apply it to proactive, sustained, hard work at improving my artistic abilities. — Waste no time. 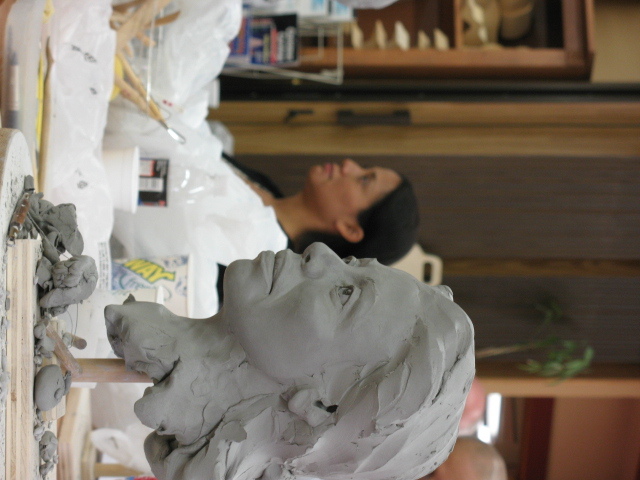 Invest every minute possible in bettering myself as a sculptor. Withdraw from non-essential commitments; minimize time spent on chores, cleaning, computer, yard etc. — Sculpt, sculpt, sculpt. Keep at it until I’m satisfied. Discard and start over as needed. Know that even “successful” artists struggle…it’s not just me…and it would greatly benefit me to learn how *not* to get mired in a state of berating myself…this only detracts from the energy available to move forward. — Sketch and/or make quick maquettes every single day to develop visualization and conceptualization skills. — Get bigger. Broaden. Wake further up each morning. Available energy is largely a decision, a choice. Shake off all shackles (fear of failure, berating myself, resistance, avoidance) and get busy exploring the vast new territory stretching infinitely before me.